The remote Caribbean coast of Nicaragua is home to the Rama Indians. This is a small ethnic group that lives in a territory between the Bay of Bluefields and the San Juan River. There are only about 3500 ethnic Rama’s left. Most of them live on a small cay in the middle of the shallow bay of Bluefields. The Rama Indians of Nicaragua coexist with the Creole population in the same area. They both use English as their mother tongue. Together they own and govern a large piece of land known as the Rama Creole Territory. 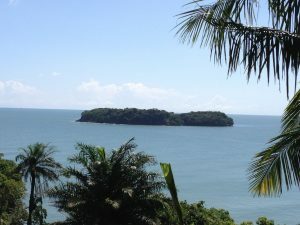 The territory includes all the land from the southern half of the Bay of Bluefields to the San Juan River. 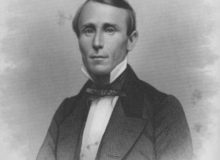 When this territory was titled to the community, there was little interest in it. Yet, the proposed Nicaragua Inter Oceanic Canal has changed perspectives. Today, the land is very valuable, as the Canal will have to cut through this territory at some point. Although the largest community is in Rama Cay, there are other important communities. Most of them are on the Coast. Monkey Point and Ban Ku Kuk are two examples. Others are right on rivers. Such is the case of Tik Tik Kanu, Corn River, and Indian River. Together, these six communities are the core of the Rama Indians in Nicaragua. 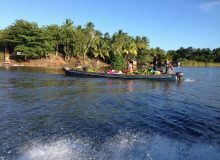 The only way to get to The Rama Creole territory is by boat. It is and is thus quite inaccessible. I had the opportunity to make a flash trip to the area, which I am happy to share! My starting point was Bluefields. There I met with the Rama Creol territorial government leaders. We planned our trip planned the day before. We agreed to meet at a dock at 6:00 a.m. for an early departure. When traveling in the ocean, the earlier you leave, the smoother your ride will be! We planned our trip to visit four rama communities: Ban Ku Kuk, Monkey Point, Tik Tik Kanu and Rama Cay. After fueling our “panga” we were ready to go! We had a glorious day at sea, clear skies, smooth sea with virtually no swells. Our first stop, the community of Baan Ku Kuk, which translated means Eagle Wings. This is a small community right on the coast. A nice beach and a rolling hill where most of the homes are behind the beach. Although the beach is nice, there is nothing much to see. A nice set of cays is just off the coast. Roughly between this community and Monkey Point. These Cays offer great coral reefs to dive and snorkel. Unfortunately, there is nowhere to rent equipment here. A playful group of kids that were enjoying the beach met us upon arrival. 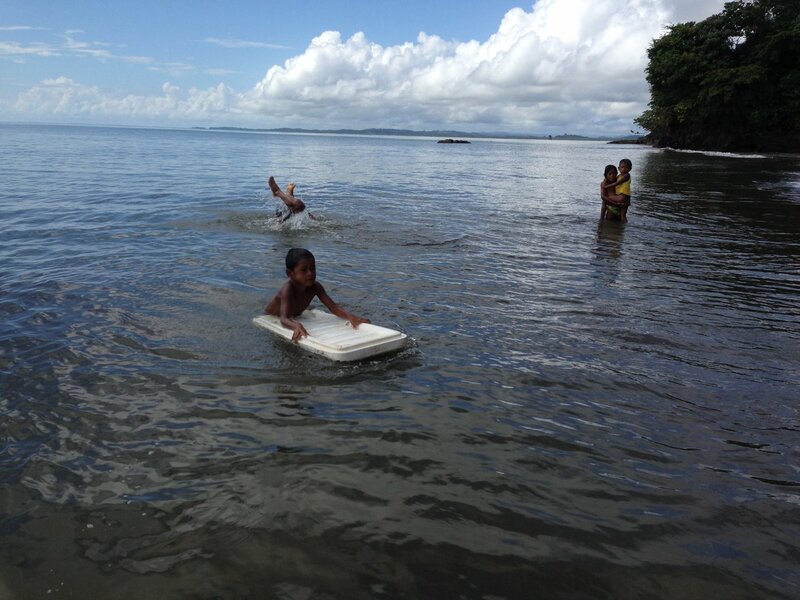 One of them was using an old ice cooler top as a surf board! Amazing how poor kids in the middle of nowhere always find something to turn into a toy! Next on our trip was Monkey Point. Despite much talk about a port facility here, the village is small. Development is almost null. A small fishing facility to refrigerate their fishing catch before they take it to the markets in Bluefields is the only modern facility here! A century ago there was an attempt to build a railroad and port here. Some old railroad wheels are all that is left of this effort. The rest of the steel was scrapped and used to build whatever they could. Monkey Point offers beautiful beaches, close access to reefs and outstanding views from high bluffs overlooking the Caribbean. But total lack of infrastructure is the main deterrent for development. Panga arriving at Rama Cay loaded with goods from the mainland. Back in Bluefields Bay, the most interesting site was Rama Cay. This community was originally established in two small cays that were near to each other. Over the years, the space between the two cays was filled in and is now used as a soccer or baseball field. Today there is only one bigger cay. The Rama Indians are Christian. They were evangelized many years ago by the Moravian Church. Thus, the only religious temple on Rama Cay is the Moravian Church. There are schools and facilities here. However, most of the agriculture and cattle raising take place back on the mainland. There are communal plots in land around the bay. There is not much do to or see in Rama Cay. Despite this, I wholeheartedly encourage a trip to the small island during your time in Bluefields. Don’t expect to spend more than two or three hours here. The pastor at the church is a good source of information. If need be, accommodations can be arranged at the communal center. Take care of your goods and documents though! There are members of the community that have a habit to get into other persons things. Keep your cash and jewelry with you at all times! The Rama people are friendly. There is concern about their long term subsistence as an ethnic group. Their reduced size, and the encroachment into their territory are a big threat. The biggest threat, is without doubt, the construction of the Nicaragua Canal through their land. Nicaragua’s National Parks System is Large! 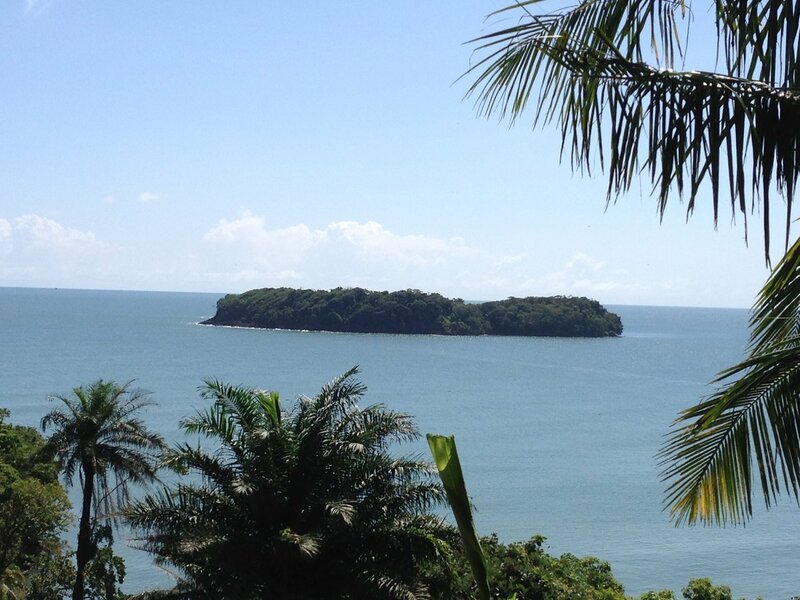 Nicaragua has a variety of protected areas that are under the administration of the Ministry of Environment (Marena). They are administrated by the office of National Parks (SINAP for Sistema Nacional de Areas Protegidas) There are 71 protected areas in Nicaragua. 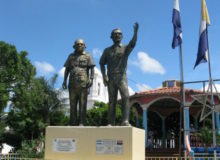 The Cosiguina Peninsula was the first area to reach that status. This was back in 1958. It was given the status of Wildlife Refuge. Since then, the national park system slowly grew into its current number of 71 protected areas. The largest of these areas are the Biosphere Reserves. Nicaragua boasts 3 of these reserves: the Bosawas Biosphere Reserve located in the RAAN (North Atlantic Autonomous Region); the Indio Maiz Biosphere Reserve in the RAAS (South Atlantic Autonomous Region) and the department of Rio San Juan. Last but not least, and definitely the new kid in the block, the Ometepe Biosphere Reserve. The Ometepe Biosphere Reserve was established in 201o. The whole Island of Ometepe is part of this reserve. The National Park System has several different titles to the areas. This indicates the specific protected status. The status includes Biosphere Reserves, Nature Reserves, National Parks, National Monuments, Nature Reserve and Wildlife Refuge. Tour bus Designed for the El Mombacho Volcano Tour. 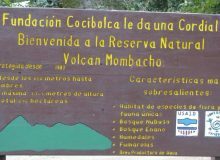 The most visited protected areas in Nicaragua are the Parque Nacional Volcan de Masaya. It is halfways between Managua and Granada. Therefore only 20 km (12 miles) from either of these cities. The other area with a high visitation is the Mombacho National Park. 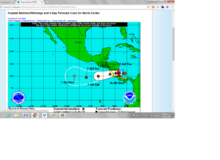 This is very close to Granada and easily within 90 minutes from Managua. 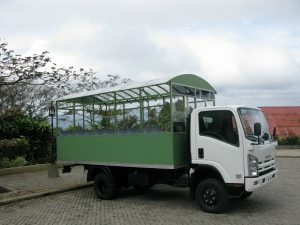 Both of these have an extensive trail system and professional guides to give you a tour of the area. Most of Nicaragua’s protected land is in the Caribbean side of the country; however there are also several outstanding protected areas within the northern central area of the country, which is the most mountainous region of Nicaragua. Surfing in Nicaragua is World Class! Surfing in Nicaragua has become a major attraction for visiting tourists. Its privileged location on the Pacific coast and the proximity of Lake Nicaragua to the Pacific Coast, has a major effect on the quality of waves for surfing. The offshore winds that are spawned by Lake Nicaragua combine with the surf coming in from the Pacific. This creates large barrel waves that break slowly and create world class surfing waves. 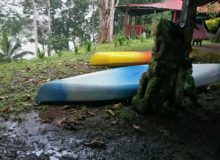 In addition, a variety of very affordable surf lodges and hostels along several villages in the Pacific coast make of Nicaragua the most affordable surfing destination in the World. The quality of surfing in Nicaragua is such that the World Masters Surf Championship took place there last year. Master surfers from around the world joined on the beaches of Tola. The mission: to challenge the surf and see who was best at it. The event was a total success, with President Daniel Ortega and Minister of Tourism Mario Salinas being present at the inaugural event and sending a clear message that Nicaragua is ready for Tourism and that the government means business when it talks about the potential for tourism in Nicaragua. 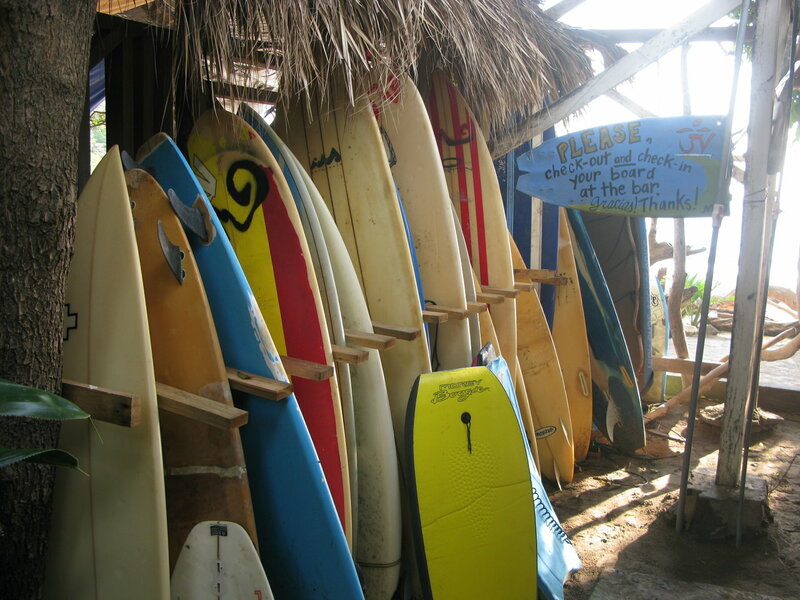 The most popular spot for surfing in Nicaragua is probably San Juan del Sur. Here you will find a variety of different lodges and facilities that cater to the surfing market. 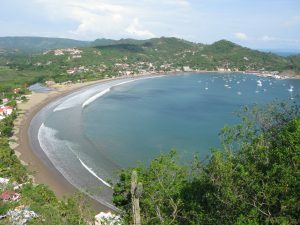 San Juan del Sur offers a nice combination of good surfing plus an outstanding all around destination with good hotels and restaurants as well as some of the best nightlife on the entire coast in Nicaragua. 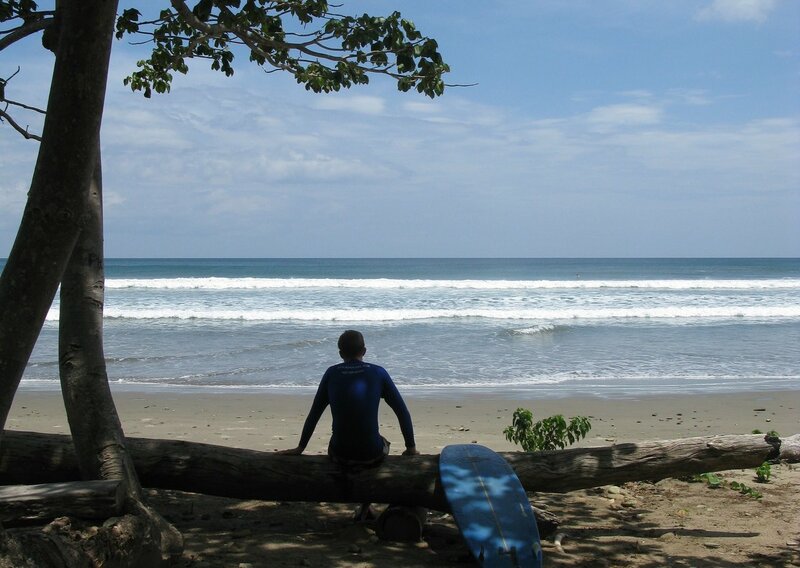 In addition, the beaches of Tola are also fantastic, and considered by many as the best in Nicaragua for surfers. Here the small fishing village at Playa El Gigante has turned into a full fledged surfing village. You you can stay cheaply in a hammock and have an informal lunch on the beach. Best of all are the ice cold beers at funky bars right on the beach. 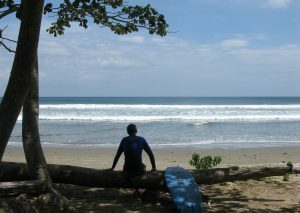 It is no longer a secret, some of the best surfing in the World at very affordable prices is right here, in Nicaragua! There is only one international airport in Nicaragua. This means that all international airlines must land in the Augusto C. Sandino Internacional Airport in Managua. All Nicaragua flights originate or end in the Managua Airport. There is non stop air service from the North American cities of Miami, Houston, Atlanta, New York, Fort Lauderdale and Mexico City into Managua. American Airlines and Avianca both offer non stop service from Miami; Spirit Air has flights into Managua from Fort Lauderdale. Delta Airlines offers daily flights into Managua from Atlanta and United does so from Houston and Newark International Airport in New York. Aeromexico offers daily service from Mexico City to Managua. As of December 2012, Blue Panorama, an Italian Carrier is offering non stop service between Rome and Managua once a week. In addition, the Central American Airlines, Copa (Panama) and Avianca (Colombia) offer an extensive network of connections using their hubs in Panama City, Panama, San Jose, Costa Rica and San Salvador in El Salvador. A small Costa Rican airline, Nature Air is currently providing air service between San Jose and Managua. Although there is just one international airport, there are several domestic airports that reduce travel time and make it faster to get to these destinations. There is only one domestic airline, La Costeña, www.lacostena.com.ni. La Costeña is affiliated with Avianca airlines and offers service with a modern 50 passenger ATR 44 as well as with 14 passenger Cesna Caravan aircraft, which are ideal for Nicaragua because of its relatively flat geography. La Costeña offers two daily flights to Bluefields and Corn Islands in the ATR 44 turbo prop. These are the two best airports after the Managua airport that are capable of receiving medium size aircraft. Recently, the Nicaraguan government has finished and put into operation three more airfields in the country, the first is the airport in San Juan de Nicaragua, on the Caribbean coast, very close to the border with Costa Rica, the second in the magical island of Ometepe, the third and last in the Tola area, very close to San Juan del Sur. All three airports are being serviced regularly by La Costeña. 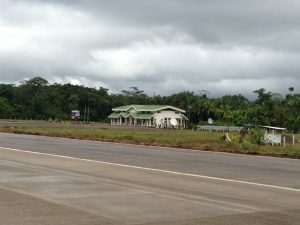 Other airfields that have regular air service are San Carlos, Puerto Cabezas, Minas, and Waspan. As you can see, these airfields are mostly located on the Caribbean coast, either on the RAAN, RAAS or Rio San Juan Departments. Did you Know that Diving in Nicaragua is Outstanding? 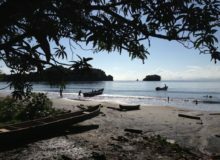 When you think about diving in Nicaragua, you usually relate to the Caribbean islands of Nicaragua: Corn Island and Little Corn Island. It is true that diving in the Corn Islands of Nicaragua is outstanding. But you will be pleased to learn about other options for diving in Nicaragua. Nicaragua is blessed with many different lakes, including a large number of crater lakes. 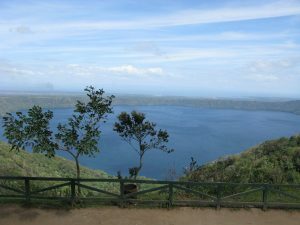 Such as the Laguna de Apoyo and the Laguna de Xiloe. The first very close to Granada, the second on the outskirts of Managua. 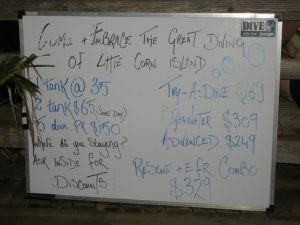 Diving in crater lakes offers a completely different experience than diving in the Caribbean reefs of the Corn Islands. Crater lakes are lakes that have formed in volcanic craters, and offer a unique ecosystem that usually has endemic species living within its waters. Such is the case in both Laguna de Apoyo and Laguna de Xiloe in Nicaragua. In addition, diving in these crater lakes gives you access to caves and views of the volcanic vents. The Xiloe crater lake offers a total of 18 different species living within its waters. With a maximum depth of 89 meters, the waters are clear, although the use of underwater flash lights is used to help improve visibility in the deep and dark waters within its realms. The Apoyo Lagoon Crater Lake offers outstanding diving conditions! The crater at the Laguna de Apoyo still has vents where sulfur gases escape into the lake, and actually keeps the water in the lagoon at a very pleasant temperature! With a depth of over 200 meters, this lagoon has a variety of endemic species that are native to this lake! The clear waters offer good visibility to a depth of about 40 meters without the aid of a flashlight. 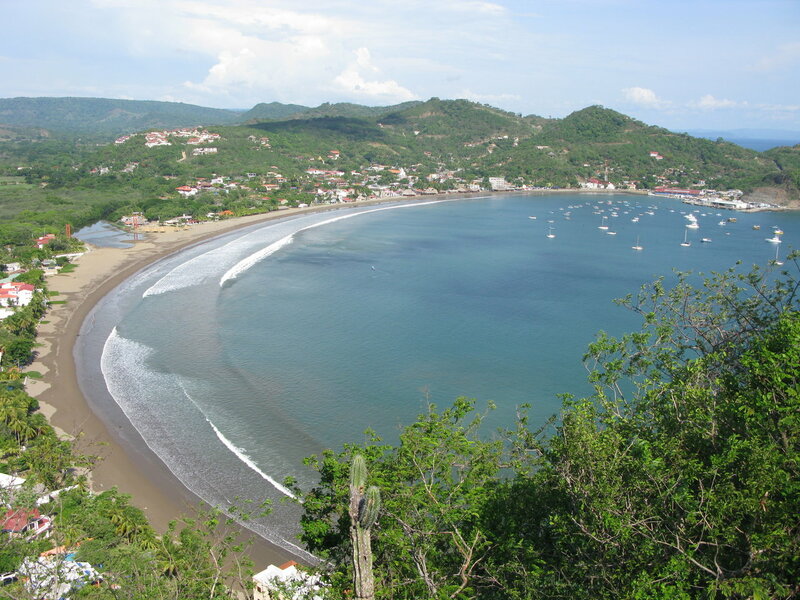 Another interesting area to do diving in Nicaragua is along the Pacific coast. Dive Nicaragua, the only PADI certified operation based on continental Nicaragua. 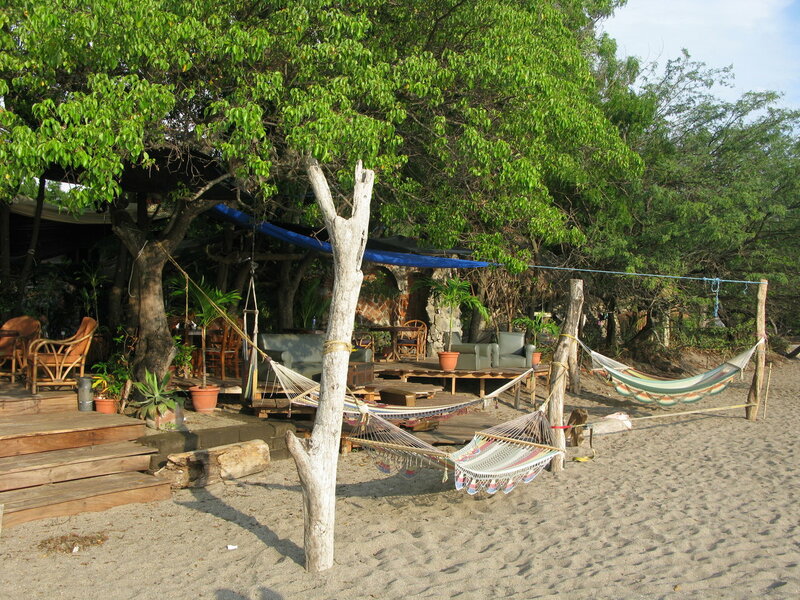 They offer diving to several different sites on the Pacific coast of Nicaragua. They use San Juan del Sur as their hub. Although the diving experience on the Pacific Ocean is not as colorful as it is in the Caribbean, if you time your dive correctly, you will be able to have a wonderful experience. If you want to take a course and get certified as a diver, contact Dive Nicaragua. They offer PADI diving certification courses which can be arrange in Managua and San Juan del Sur. 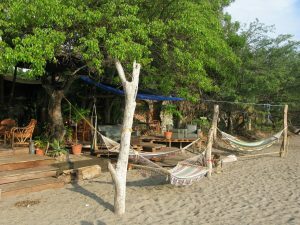 As you can see, there are actually several different options to do diving in Nicaragua, and they all provide for a rich, different experience that will prove to be a highlight of your visit to Nicaragua.